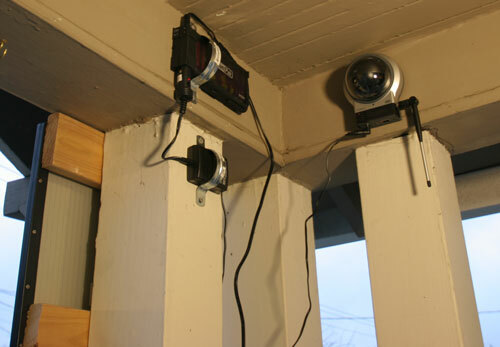 Over at Jake Ludington’s site, he’s got a tutorial on a do it yourself solar powered security camera. He gives some suggestions for available and fairly inexpensive parts that you can buy, though you can substitute a variety of similar components. Most of his parts were bought at Fry’s, though it’s obvious this is all off the shelf type stuff. About the only thing you need to consider is how big a solar panel you need. One key to making this work is having a solar panel capable of recharging your batteries fast enough to collect more power during daylight hours than you actually consume. This way you recover any power used overnight while also powering the wireless camera using the solar panel during daylight hours. Without factoring power consumption into your plan from the beginning, you eventually run out of power and lose your security camera when there is no sun. If I were to swap out my current solar panel, it would be for one with more potential power collection like a 15 watt model. Jake’s shows this rig working as a “front porch” camera, monitoring someone at your front door… not having to worry about AC or computer wiring running out to your front porch. This could easily work as a camera in a detached garage, (check your wifi signal strength) or a camera near your front gate. Maybe you need a camera pointing out to the driveway or front entrance – just mount it under your eaves, and run the solar panel on the roof with the battery pack and adapters hidden in your attic.